Close your eyes, and pretend you’re in a high-end restaurant. What are they serving? Fancy, expensive foods like caviar, foie gras, and truffles, right? What would you say if I told you that you could get one of those at a popular fast food restaurant in Japan? Would you believe me? Well, you should, because Nakau, the quick eats restaurant that specializes in rice bowls, now has a fancy spin on a staple Japanese comfort food: oyakodon with truffles! Oyakodon (literally “parent and child bowl”) is ordinarily just chicken and eggs cooked together and tossed over rice, so adding truffles to it makes it way more of a delicacy than it has any right to be. So how does it taste? Of course, we had to find out. 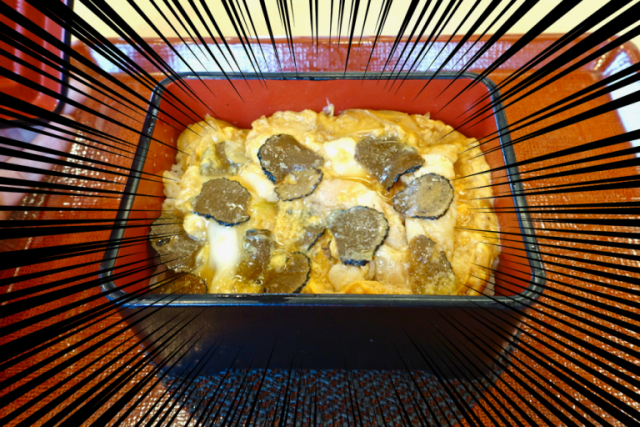 According to Nakau’s website, this special Truffle Oyakodon contains sliced truffles that were imported directly from Italy via air freight. 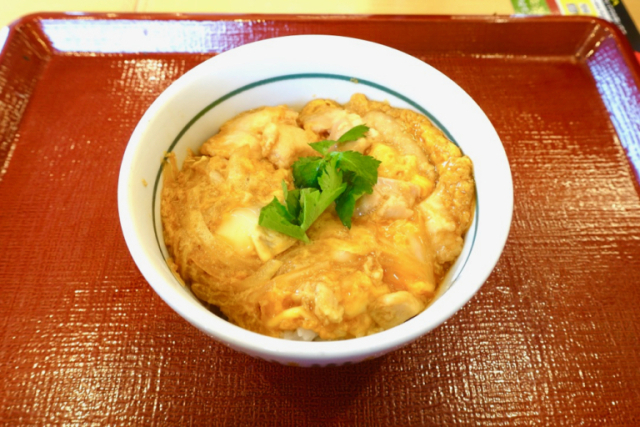 There are no added flavors to the oyakodon besides the ordinary recipe ingredients and the truffles, which should make it a purely high-class experience. 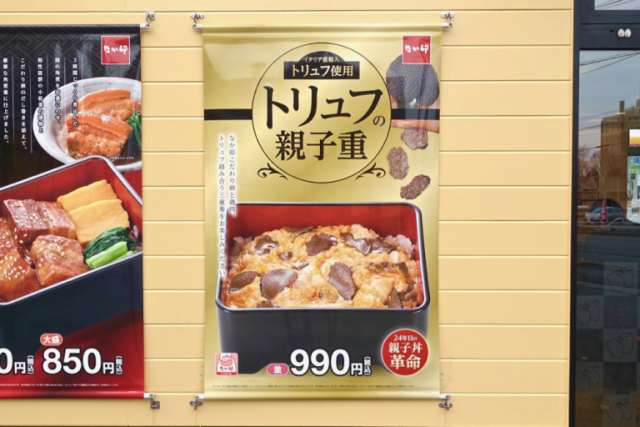 The Truffle Oyakodon costs 990 yen, which is a little pricey since the regular oyakodon at Nakau costs only 490 yen. However, if the Truffle Oyakodon really has real truffles in it, then it’s well worth the price! It certainly looks fancy in its square-lidded rice bowl, which came just five minutes after we ordered it. Holding our breath and trying not to let our expectations get too high, we opened the box. It was almost the same as the poster in the shop! There were plenty of slices of truffles scattered all throughout the bowl. Feeling our hearts thumping with excitement, we pressed our nose close to the box, and took a deep sniff. But it didn’t really smell like truffles at all. We weren’t too discouraged, though, because we firmly believed the flavor of the truffles would still be potent and delightful. Fully ready for a high-class oyakodon experience, we scooped up egg, chicken, truffles all in the same spoonful and lifted the utensil to our mouth. Well, we can’t deny that as far as oyakodon goes it was a delicious bowl of rice, eggs, and chicken, but the flavor of the truffles themselves was pretty faint. The dish was so full of truffle slices that we really thought it would also be full of truffle flavor, but perhaps our expectations were a little high. We didn’t quite want to give up yet, though. To really get a feel for the flavors of the Truffle Oyakodon, we decided to order a regular oyakodon (mini size) and compare them by the spoonful to see if the truffle flavor comes out a little more strongly. As expected, since the flavor of the truffles is really faint, there wasn’t a huge difference between the flavors of the two rice bowls. However, there was a major texture difference.The truffles added an extra crunch to an otherwise soft meal, and it was almost like eating matsutake mushrooms, with their full-bodied yet also mild flavor. So, in the end, we have to admit that the Truffle Oyakodon did not quite meet our expectations when it came to flavor profile. That being said, it is a pretty unusual take on a traditional Japanese rice bowl, so even if it wasn’t as truffle-y as we me might have liked, it’s still worth trying! If you’re interested, give it a try at a Nakau sooner rather than later, since this rice bowl is being made in limited quantities, and will disappear by the end of January. The question is, where are the black Truffles from ?? ?.China, S.Korea, India Or where ???. One kg of truffles from Alba, Piemonte in North of Italy cost 550,000 yen, other parts of Italy like Abruzzo cost a little less. But to find real truffles, U have to train yr dogs for years. Do I need to tell U , how much natural good dog food cost ?? ?.Still, U cannot have yr truffles at this price. To all people in Japan, pls educate yrselves before we become fools and get conned by sweet words in talk & advertistments. Pls wake up.